TOKYO, Nov 21, 2016 - (JCN Newswire) - Forbes Japan, the Tokyo-based edition of Forbes, one of the world's most authoritative business news medias, celebrated entrepreneurs and Start-ups today at the Annual "JAPAN'S STARTUP" Awards, and the winner of the 'RISING STAR' STARTUP OF THE YEAR 2017 Award - Trillium Inc, a Tokyo-based Start-up that has developed a robust, comprehensive cybersecurity solution for the automotive industry. The Awards promote start-ups ready to create a 'New Japan' - leading the Japanese economy into the next age through innovation and entrepreneurial efforts. Finalists for the 'RISING STAR' 2017 were selected by the Forbes Japan editorial team with input from online readers. The winning Start-ups will be featured in the magazine's Jan 2017 edition, which will appear on Nov 25. David Uze, Trillium CEO, an American who has lived in Japan for over 25 years, hopes Trillium can make a valuable contribution to his adopted country. "As autos and electronics are the bedrock of Japan's prosperity, we believe our cybersecurity solution can help ensure the nation's economic future. And we are grateful to Forbes Japan for recognizing the importance of our work." "This is another indication that Trillium is on track to emerge as that rarest of creatures, a 'Made-in-Japan Innovator,'" said Uze. "For automakers, cybersecurity is a mission as urgent as ending hydrocarbon use. Plans for innovation across-the-board depend on digitizing tomorrow's cars: in emissions, safety, autonomous drive, driving dynamics and infotainment. But until they find an adaptive, multi-layered solution to cyber threats, all plans could come screeching to a halt with one devastating hack. The industry doesn't yet have a solution - but we do, and we're ready to go." Trillium's 'Made-in-Japan solution' strongly secures all three key 'cyber-threat domains' in the car with a software-based approach that is compatible with any architecture or operating system. More than just robust and comprehensive, it can be implemented for as little as 1/20th the cost of competing solutions - most of which are still under development. "Meanwhile, our multi-layered solution is at an advanced stage," Uze said. "We have moved into the real-world testing phase via partnerships with a legendary Japanese Super GT racing team and a leading maker of automotive semiconductors. And we are now in discussions with a wide range of automakers and tier-one component suppliers. We're ready to implement whenever they are." Trillium Inc. was founded in 2014 with a team of executives and engineers from Japan, Europe and the U.S. with extensive experience in relevant fields, backed by lead investment from Global Brain Corp, a Tokyo-based venture capitalist. 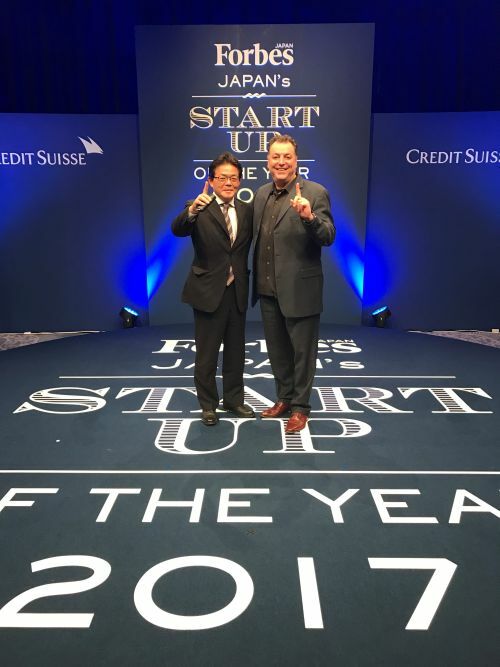 Yasuhiko Yurimoto, Founder & CEO of Global Brain, Trillium Lead Investor, and David M. Uze, CEO of Trillium at the Forbes Japan "RISING STAR START-UP OF THE YEAR 2017" Awards, November 21, at the Palace Hotel, Tokyo.